Jonathan Fishman, Edward Fisher, Musheer Hussain,	The Journal of Laryngology & Otology, Volume 132 Issue 12, p 1045. G Tirelli, N Gardenal, A Gatto, E Quatela, G C Del Piero,	The Journal of Laryngology & Otology, Volume 132 Issue 12, pp 1046-1050. R Hu, B-B Yang,	The Journal of Laryngology & Otology, Volume 132 Issue 12, pp 1051-1060. The Journal of Laryngology & Otology, Volume 132 Issue 12, pp 1061-1066. M R Williams, R Eccles,	The Journal of Laryngology & Otology, Volume 132 Issue 12, pp 1067-1071. T Hardcastle, A Wood,	The Journal of Laryngology & Otology, Volume 132 Issue 12, pp 1072-1076. B Paul, S S Menon, R Vasthare, R Balakrishnan, S Acharya,	The Journal of Laryngology & Otology, Volume 132 Issue 12, pp 1077-1082. J Choi, H Dharmarajan, J Yu, K A Dunsky, T J Vece, E H Chiou, J Ongkasuwan,	The Journal of Laryngology & Otology, Volume 132 Issue 12, pp 1083-1087. 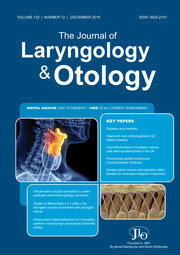 A Doğan, N Bayar Muluk, N Asal, M H Şahan, M Inal, Ö Gündüz, O K Arıkan,	The Journal of Laryngology & Otology, Volume 132 Issue 12, pp 1088-1092. C Swords, A Manji, E Ward, A Arora,	The Journal of Laryngology & Otology, Volume 132 Issue 12, pp 1093-1096. M T Kalcioglu, Y Ileri, O I Ozdamar, U Yilmaz, M Tekin,	The Journal of Laryngology & Otology, Volume 132 Issue 12, pp 1097-1101. S M Adnan Ali, S Naeem, Y Mirza, N Zahid, M S Awan,	The Journal of Laryngology & Otology, Volume 132 Issue 12, pp 1102-1109. B L Voth, J P Sheppard, N E Barnette, V Ong, T Nguyen, C H Jacky Chen, C Duong, J J Arsenault, C Lagman, Q Gopen, I Yang,	The Journal of Laryngology & Otology, Volume 132 Issue 12, pp 1110-1118. J F Guest, K Rana, C Hopkins,	The Journal of Laryngology & Otology, Volume 132 Issue 12, pp 1119-1127. K Fujiwara, K Kawamoto, K Taira, T Fukuhara, S Koyama, H Kataoka, H Kitano, H Takeuchi,	The Journal of Laryngology & Otology, Volume 132 Issue 12, pp 1128-1133. S Elwany, S Radi, H Khalil, I Talaat, K Belasy,	The Journal of Laryngology & Otology, Volume 132 Issue 12, pp 1134-1137. C R Davies-Husband,	The Journal of Laryngology & Otology, Volume 132 Issue 12, pp 1138-1142. K Sato, S Chitose, F Sato, H Umeno,	The Journal of Laryngology & Otology, Volume 132 Issue 12, pp 1143-1146. A Kelkar, I Johnson,	The Journal of Laryngology & Otology, Volume 132 Issue 12, pp 1147-1149. R Lawrence, E Jeffs, DEH Hartley,	The Journal of Laryngology & Otology, Volume 132 Issue 12, pp 1150-1152.